As winter weather blows in, it's time to lace up the skates and test those blades of glory. Fortunately, NYC is home to plenty of places to skate, indoors and outside, that make this cold weather activity a cinch to take part in. Scroll through to see where you can hit the ice around the city. An impressive collection of shops surrounds this free ice rink in the middle of midtown, between 40th and 42nd streets and Fifth and Sixth avenues. Shop for your holiday gift needs, sample some local fare and work on those triple salchows. Hours: The rink is open 7 days a week from 8 a.m. to 10 p.m. until March 3. Cost: Free; $20 for skate rentals. If you want to skip the line you can purchase an Express Skate for $30 per person. The World Ice Arena at Avery Avenue and 131st Street in Queens is open all year and offers a large, indoor rink for a full schedule of public skating, speed skating, hockey, figure skating and more. Just steps from NBC studios and the Rockettes at Radio City Music Hall, The Rink offers several seasonal activities for a truly New York experience. In Prospect Park, near the entrance at Parkside and Ocean avenues, LeFrak Center at Lakeside consists of two open-air, connected rinks and is open through March 24 for Brooklynites who want to enjoy the great outdoors. Hours: Covered rink: 9 a.m. to 5 p.m. Monday; 9 a.m. to 5:30 p.m. Tuesday-Friday; noon to 9 p.m. Saturday; noon to 5 p.m. Sunday; Uncovered rink (weather-permitting): 9 a.m. to 5 p.m. Monday; 9 a.m. to 7:15 p.m. Tuesday-Thursday; 9 a.m. to 9 p.m. Friday; 10 a.m. to 9 p.m. Saturday; and 10 a.m. to 5 p.m. Sunday. 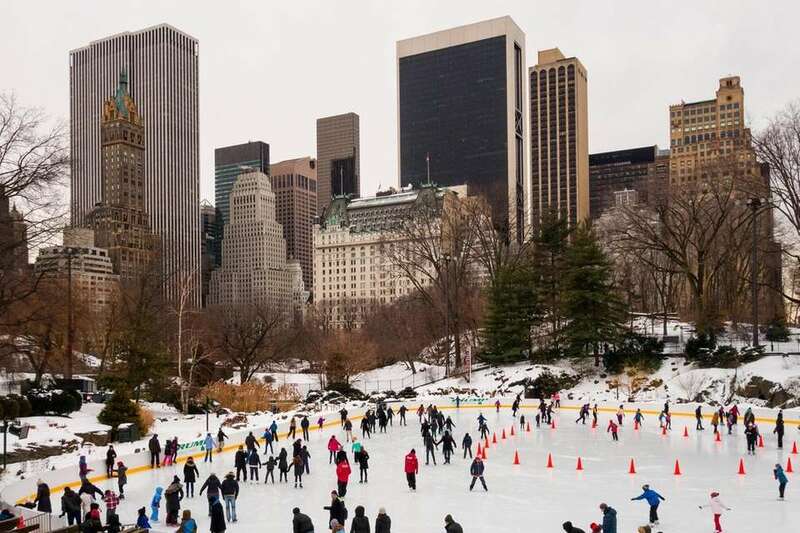 Skate with the Manhattan skyline behind you and Central Park's beauty surrounding you at Wollman Rink at 63rd Street inside the park. It's open through April 7. Hours: 10 a.m. to 2:30 p.m. Monday-Tuesday; 10 a.m. to 10 p.m. Wednesday-Thursday; 10 a.m. to 11 p.m. Friday-Saturday; 10 a.m. to 9 p.m. Sunday; 10 a.m. to 7 p.m. on Christmas Eve and New Year's Eve; 10 a.m. to 11 p.m. on Christmas Day and New Year's Day. At the northernmost end of Central Park, near the entrance at 110th Street and Lenox Avenue, sits Lasker Rink, which doubles as a swimming pool in the summer. Lasker has two oval rinks -- one for high school hockey and one for all ages. Check its schedule to see when the rink is open during the holiday season. Hours: 9:30 a.m. to 4 p.m. Monday, Tuesday and Thursday; 9:30 a.m. to 2:30 p.m. Wednesday; 9:30 a.m. to 4:50 p.m. and 6 p.m. to 11 p.m. Friday; 1 to 11 p.m. Saturday; 12:30 p.m. to 4:30 p.m. Sunday; open through March 31.